Within our small island community we don't have many local weddings, although some visitors do come here to get married. It was therefore hugely exciting to see the much loved Kate Clement and Andy Lawson get wed last Saturday, the 10th November 2018. The proud father of the bride escorts her down the aisle. The church was full with standing room only for latecomers. 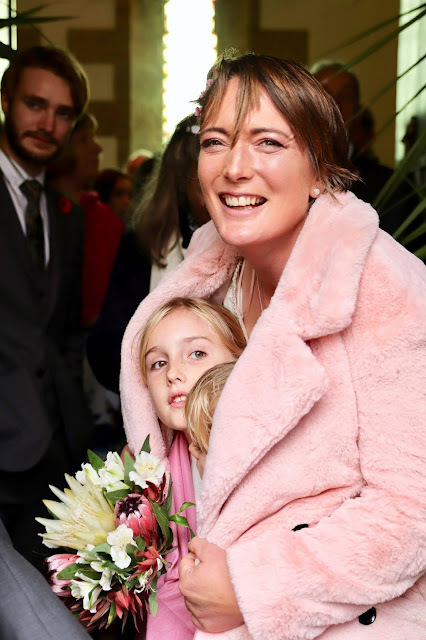 Kate spent the entire day with an enormous grin across her face - she had looked forward to this moment for a long time. Dearest Kate! I love her earnest look as Andy takes his vows. Talk about hanging on his every word! 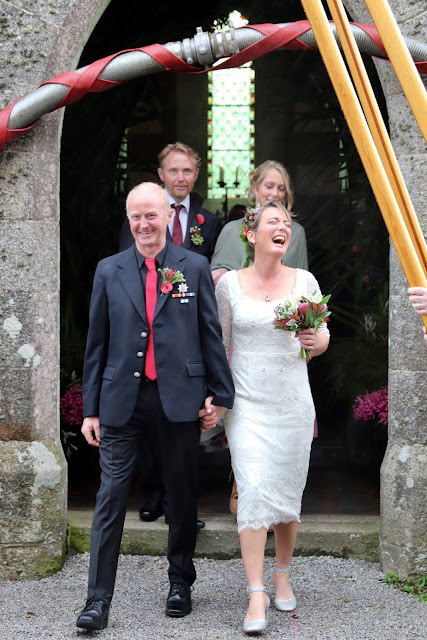 The relief is enormous as the happy couple emerge from the church. Andy is a member of our Auxiliary Fire Service which explains the water hose above the church doorway. 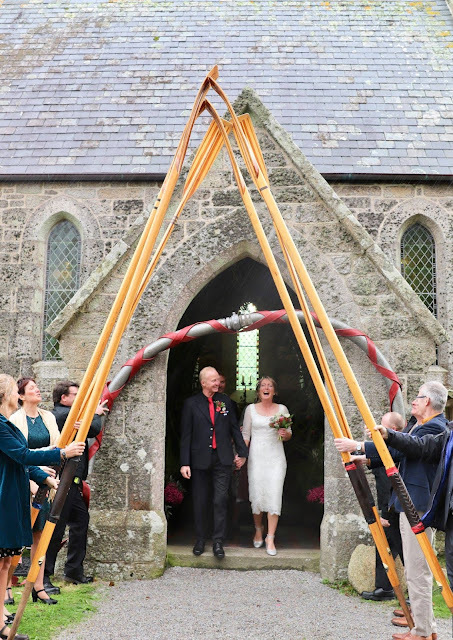 Kate rowed in the ladies gig crew for many years hence the gig paddles creating an archway for the happy couple to pass through for luck. The wedding day weather had been a mixture of sunshine and showers. 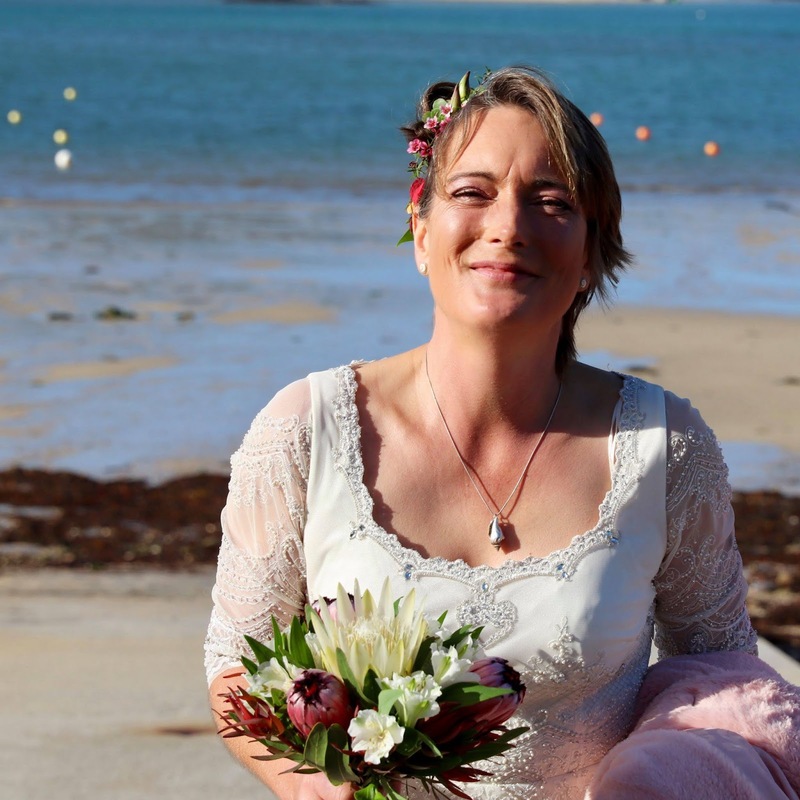 We were all delighted when the bride arrived in glorious sunshine. But just as Mr & Mrs Lawson stepped outside the porch to start married life together the heavens opened! This has to be my favourite capture of the day. 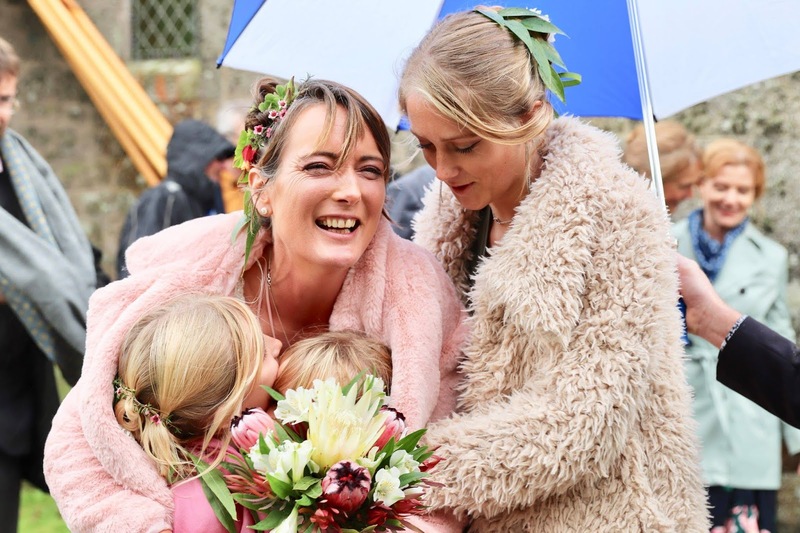 Kate looks radiant as she huddles together with her darling nieces. 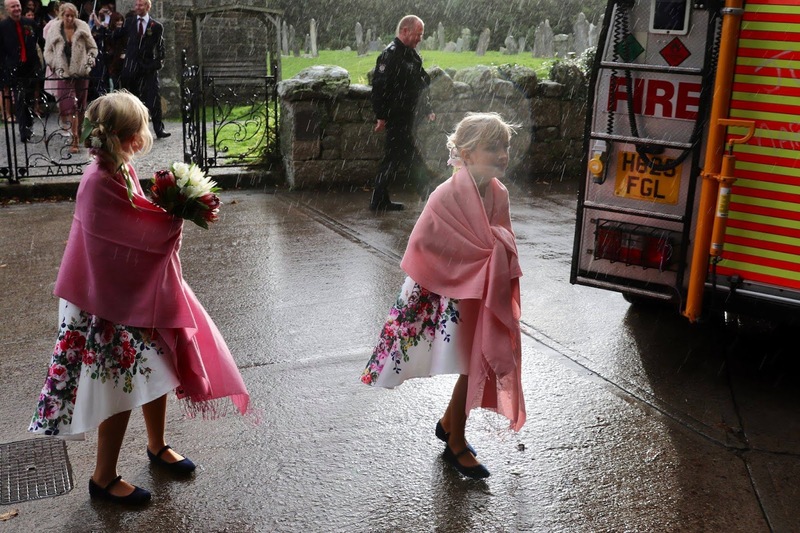 Gemma and Elsa are terribly chic young ladies. 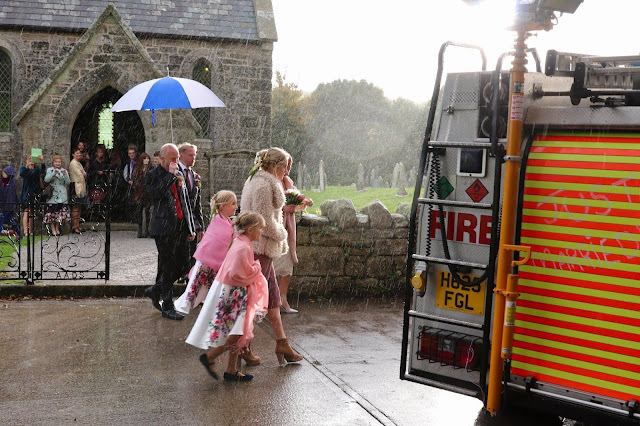 The bride and groom, the bridesmaids and best man all took refuge in the fire truck which transported them all on to the Abbey Gardens for a photo shoot. Kate came to the island 11 years ago to volunteer for a week at the Abbey Garden. After extending her stay for another two weeks she was offered a job as gardener on the Cottage Department where she still works happily, enjoying the independence it gives her as well as the opportunity to be creative as she tends the small cottage gardens preparing them for the new influx of guests. Andy is the Head Gardener at the Abbey Garden and can be seen throughout the summer giving guided tours through his empire. He is an expert tree surgeon too as well as a skilled propagator and veg gardener. His love of plants has led him to travel far and wide, gathering specimens to add to the garden collection. Andy and Kate have been together for 10 years now. 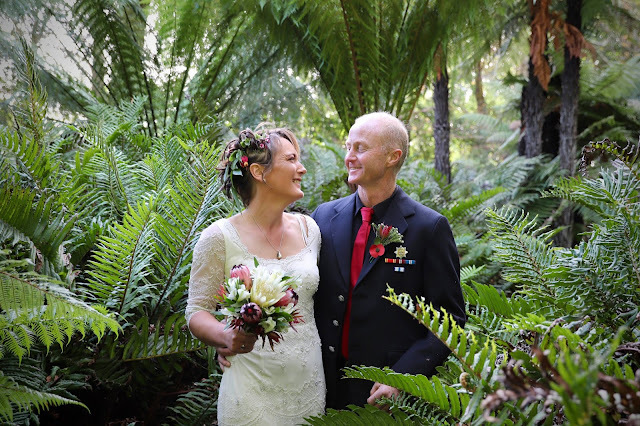 Their joint passion for plants is a strong bond between them - tomorrow the couple are leaving to go on honeymoon to South Africa, home to many of the plants Andy cares for within the Garden. A reminder of the other aspect of Kate's life - she loves to sea swim and we've had many an adventure together. 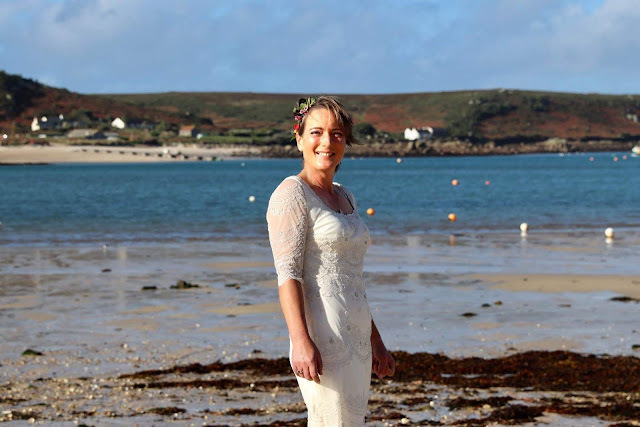 We encountered inquisitive seals as we swam from Samson to St Agnes on a training day and we've also battled our way through a lively sea swell with a brisk head wind the time we decided to swim from New Grimsby to Appletree Bay just for a laugh. Kate is a true water babe who rocks a bikini too! Kate and Andy are at the heart of our community, involved in all the things that cement island life, from the annual fete to weekly cricket, table tennis and card games in the pub as well as Sunday drinks gatherings on their patio which affords the best vantage point across New Grimsby. 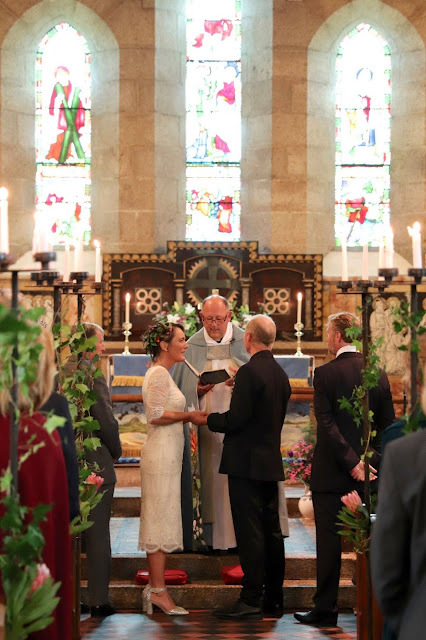 This long awaited wedding was a wonderful gathering of both families from as far as Bali, Denmark, France and Scotland and friends, also from far flung places as well as those from the islands. 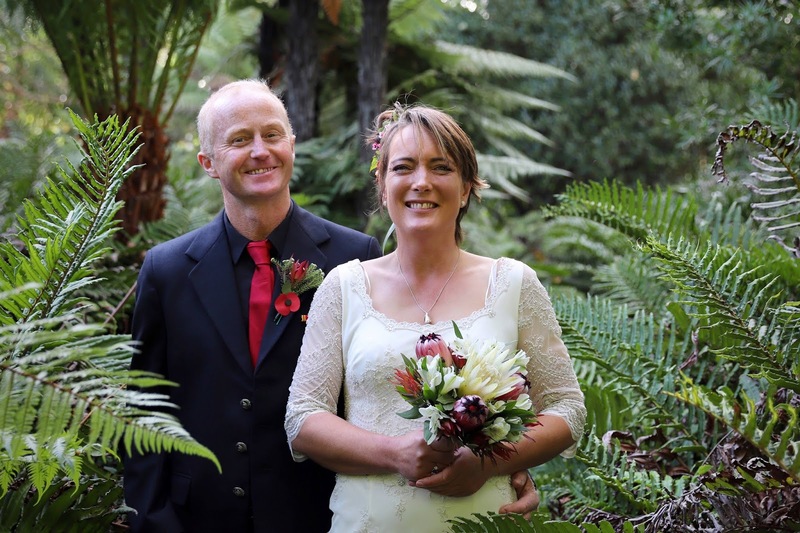 Congratulations to this much loved and popular couple - thank you for including us in this unique island event. Three cheers for Mr & Mrs Lawson! Labels: an island wedding, featured, gig paddles, Kate and Andy got married! 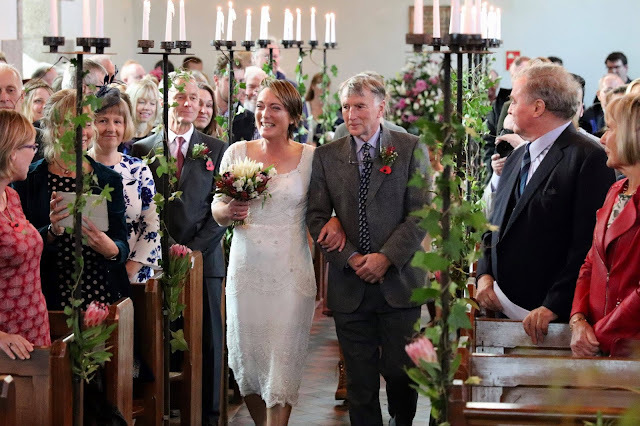 what a lovely post, it's really heartwarming to see the lovely couple and all the smiling faces! and the cute little ladies! Thanks so much Monica. It really was such a special day and yes, the little bridesmaids are adorable! Hello and welcome Pat! Thanks for joining my readership and I hope to hear from you again. Happy reading! What a romantic story, and a lovely wedding! It must be quite the to-do, with the island's small population! I love Kate's dress and seeing everyone so fancy. Can't wait to see what you wore, Anna! It's a romantic tale indeed Sheila, with the culmination a real cause for celebration for our little island community. I do hope you like my reveal today! 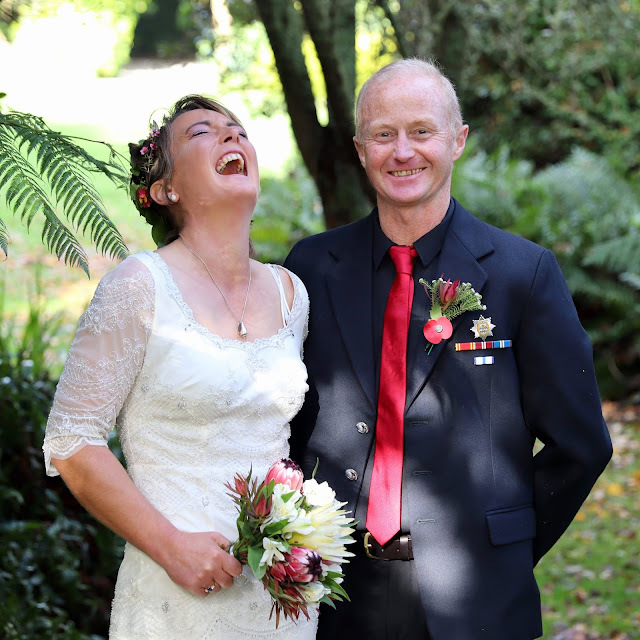 I'm completely caught up in the romance of these lovely wedding photos. Not only are they uplifting with traditional wedding joy but the give another glimpse of the charm of your island life. I'll bet you and Kate are very close because of the ocean swims you share. I would think there's a certain intense mindfulness and connection to self and nature to be found in this activity. I think we all like a romantic love story don't we Jude? And this local tale delivers everything for us to enjoy. Kate and I have built a strong friendship and yes, probably that's to do with our common bond - the sea swimming can be a challenge and therefore there's often a high for us at the end of a good swim. Congretulations to Kate and Andy! You've captured some amazing pictures of Kate - she looks so happy! I love the candle and flower decorations in the church. Beautiful wedding. The photographer on the day was a relative of Kate's and my goodness, didn't she do a marvellous job! And goodness yes, wasn't the church just beautiful. Lovely photos, they look so happy. Your pics truly capture the magic of the day. The dress was oerfect. It's nice to see who tends the cottage and Abbey gardens so beautifully. But that swim from New Grimsby - that a HUGE distance!!! Weren't they looking the picture of wedded bliss Mary? It was a fabulous day, made so special by all of the friends and relatives who travelled from far away to attend. Our swims have always been great fun and the longer ones are always a healthy challenge - we egg each other on. Oh how wonderful this was to read. What a great couple and how brilliant to finally reach this day! They look beautiful and I love the symbolism of the oars and hose! Thanks for that Kezzie. My husband and I have wedding pics with us under the oars too - it makes for such a unique reminder of the day. It was, totally perfect, Greetje! It all looked awesome didn't it Jacqui. I was at the back of the church, trapped inside while the rain tipped down and nobody wanted to venture out in the downpour. We caught up with the bridal party at the reception later though.